I love to eat Thanksgiving treats, especially chocolate pie. Each year we have a variety of Thanksgiving traditions that include eating a lot of yummy food and a few favorite treats. 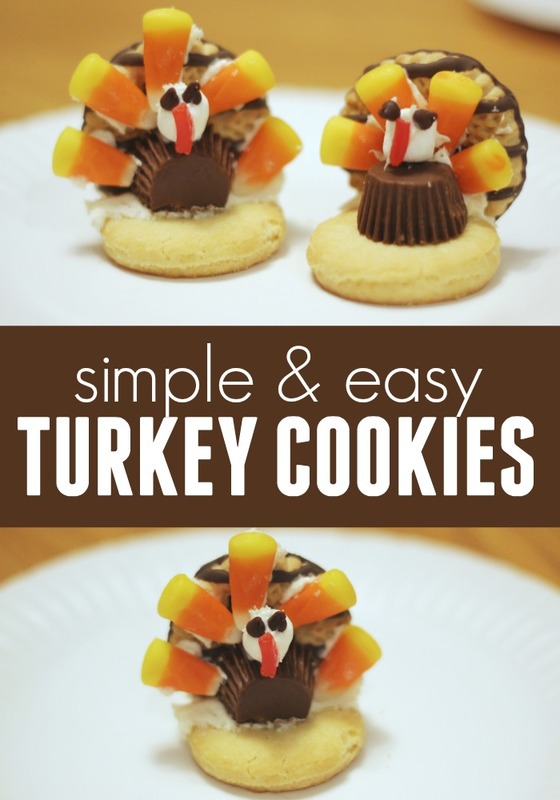 One activity that we try and squeeze in every Thanksgiving is making turkey cookies. Often we will make our simple turkey cookies to put next to each plate as a little place card or small decor item. Turkey cookies are delicious, fun to make, and a simple way to help kids create on Thanksgiving. Here are the materials needed to make one turkey cookie. I have made these turkeys with girl scouts, preschoolers, middle schoolers, and even a few grown ups. Everyone enjoys them and has fun making them! These turkey cookies are a treat. There is nothing healthy about them... but they sure are yummy! To get started, cut off part of the striped cookie to make one side flat. Next, use frosting to attach the striped cookie to the back part of the shortbread cookie. After that, add a little bit of frosting to the front of the cookie and then add half of a peanut butter cup to create the turkey's body. Next, use some frosting to stick candy corn onto the striped cookie to create 5-6 feathers. After that, add a marshmallow on top of the peanut butter cup to be the turkey's head. Lastly, add on some mini chocolate chips as eyes and a twizzler pull n peel as the red gobbler. 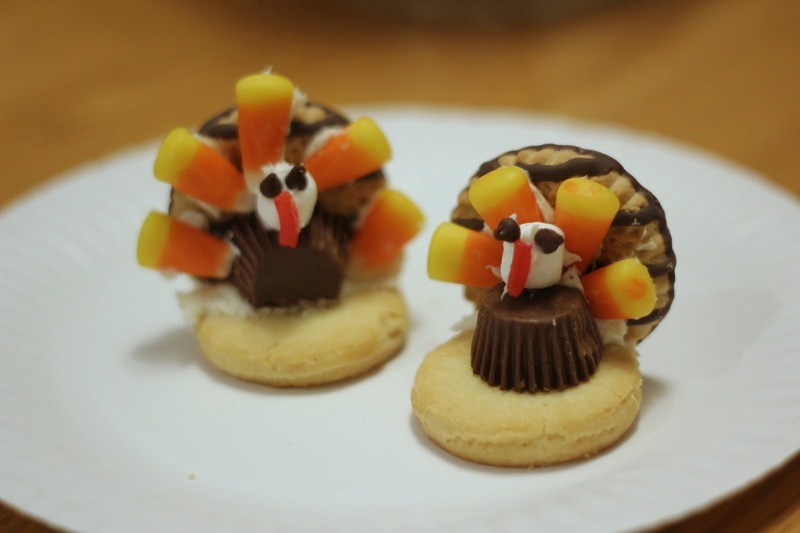 These cookies look like they are ready to be gobbled up right away! 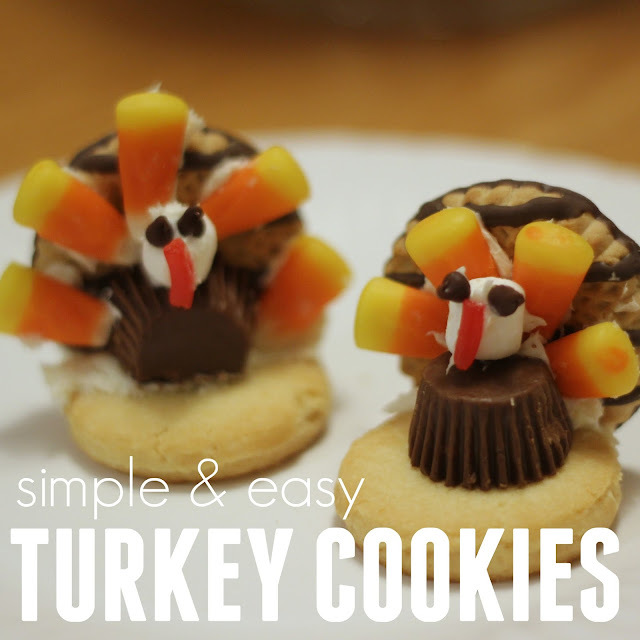 Have you ever made turkey cookies before? These ones are SO EASY ! Find more of our favorite Thankgiving crafts and activities for little ones HERE.